"Matawan" redirects here. For other uses, see Matawan (disambiguation). Map of Matawan in Monmouth County. Inset: Location of Monmouth County highlighted in the State of New Jersey. Matawan is a borough in Monmouth County, New Jersey, United States. As of the 2010 United States Census, the borough's population was 8,810, reflecting a decline of 100 (-1.1%) from the 8,910 counted in the 2000 Census, which had in turn declined by 360 (-3.9%) from the 9,270 counted in the 1990 Census. Matawan is part of the Bayshore Regional Strategic Plan, an effort by nine municipalities in northern Monmouth County to reinvigorate the area's economy by emphasizing the traditional downtowns, dense residential neighborhoods, maritime history, and the natural beauty of the Raritan Bayshore coastline. The Lenape Native Americans called the area "Mechananienk", a Lenape language word meaning "where two rivers come together", which gave rise to the area being called "Matovancons" by Dutch settlers, from which derives the name "Matawan". which may derive from a Lenape word meaning "where two rivers come together". It may also originate from the Southern Unami Matawonge, "bad riverbank" or "bad hill", a possible reference to bluffs along Raritan Bay which were subject to erosion and collapse prior to the construction of a seawall in the 1970s. Another possible source is Matawan, Northern Unami for "bad fog", which may have referred to fog generated on Raritan Bay. Other possible meanings are "magician", "charmed skin" or "it arrives in a lake". The community was established by Dutch settlers in the 17th century (Matawan celebrated a tricentennial in the 1980s). Scotch-Irish settlers from New Hampshire later named the town New Aberdeen. Neighboring Matawan Township reused the historic name in the 1970s when it changed its name to Aberdeen Township. It was the formation of Matawan Township in 1857 that shifted this area's name from Middletown Point to Matawan. Matawan was formed as a borough on June 28, 1895, from portions of Matawan Township (now Aberdeen Township), based on the results of a referendum held that day. Matawan expanded with portions of Matawan Township in 1931 and 1933, and from Madison Township (now Old Bridge Township) in 1939. Despite being 11 miles (18 km) from the Atlantic Ocean, Matawan was the site of three shark attacks on July 12, 1916, in Matawan Creek, causing two deaths. They closely followed an attack in Beach Haven on July 1 and one in Spring Lake on July 6 that were all part of the Jersey Shore shark attacks of 1916. Matawan played an important role in aviation navigation history. In 1944, the first operational Visual Aural Range (VAR) was installed at Matawan. Designed in 1937 at the Bureau of Air Commerce's research center, this system operated in the VHF band around 63 mHz and was an incremental improvement over prior aviation navigation systems such as the four-course radio range. VAR was later redeveloped into VOR. According to the United States Census Bureau, the borough had a total area of 2.403 square miles (6.225 km2), including 2.261 square miles (5.856 km2) of land and 0.142 square miles (0.369 km2) of water (5.92%). Unincorporated communities, localities and place names located partially or completely within the borough include Freneau and Oak Shades. The borough borders Aberdeen Township and Marlboro Township in Monmouth County, as well as Old Bridge Township in Middlesex County. 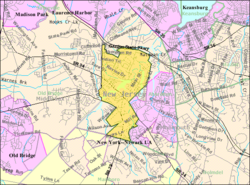 Matawan divides Aberdeen Township into two non-contiguous sections, with a small wedge-shaped exclave on the township's southwest corner separated from the rest of the township by a portion of Matawan located on the opposite side of Route 79. As of the 2010 United States Census, there were 8,810 people, 3,358 households, and 2,280.082 families residing in the borough. The population density was 3,896.6 per square mile (1,504.5/km2). There were 3,606 housing units at an average density of 1,594.9 per square mile (615.8/km2). The racial makeup of the borough was 80.98% (7,134) White, 7.04% (620) Black or African American, 0.11% (10) Native American, 6.41% (565) Asian, 0.01% (1) Pacific Islander, 2.77% (244) from other races, and 2.68% (236) from two or more races. Hispanic or Latino of any race were 10.77% (949) of the population. There were 3,358 households out of which 32.3% had children under the age of 18 living with them, 53.0% were married couples living together, 10.6% had a female householder with no husband present, and 32.1% were non-families. 24.7% of all households were made up of individuals, and 7.7% had someone living alone who was 65 years of age or older. The average household size was 2.59 and the average family size was 3.15. In the borough, the population was spread out with 22.6% under the age of 18, 8.1% from 18 to 24, 29.7% from 25 to 44, 28.0% from 45 to 64, and 11.7% who were 65 years of age or older. The median age was 38.3 years. For every 100 females there were 94.5 males. For every 100 females ages 18 and older there were 90.8 males. The Census Bureau's 2006–10 American Community Survey showed that (in 2010 inflation-adjusted dollars) median household income was $68,375 (with a margin of error of +/- $7,318) and the median family income was $85,677 (+/- $6,353). Males had a median income of $57,376 (+/- $10,034) versus $42,255 (+/- $14,121) for females. The per capita income for the borough was $39,773 (+/- $5,834). About 3.5% of families and 5.2% of the population were below the poverty line, including 9.6% of those under age 18 and 5.4% of those age 65 or over. As of the 2000 United States Census there were 8,910 people, 3,531 households, and 2,376 families residing in the borough. The population density was 3,909.1 people per square mile (1,508.8/km2). There were 3,640 housing units at an average density of 1,597.0 per square mile (616.4/km2). The racial makeup of the borough was 82.35% White, 6.53% African American, 0.02% Native American, 7.99% Asian, 0.02% Pacific Islander, 1.23% from other races, and 1.85% from two or more races. Hispanic or Latino of any race were 6.45% of the population. There were 3,531 households out of which 30.2% had children under the age of 18 living with them, 54.3% were married couples living together, 9.1% had a female householder with no husband present, and 32.7% were non-families. 25.6% of all households were made up of individuals and 7.8% had someone living alone who was 65 years of age or older. The average household size was 2.52 and the average family size was 3.07. In the borough the population was spread out with 22.6% under the age of 18, 7.3% from 18 to 24, 36.4% from 25 to 44, 23.3% from 45 to 64, and 10.5% who were 65 years of age or older. The median age was 36 years. For every 100 females, there were 97.6 males. For every 100 females age 18 and over, there were 95.8 males. The median income for a household in the borough was $63,594, and the median income for a family was $72,183. Males had a median income of $51,924 versus $37,113 for females. The per capita income for the borough was $30,320. About 3.8% of families and 5.4% of the population were below the poverty line, including 6.9% of those under age 18 and 7.3% of those age 65 or over. Matawan is the northern terminus of the middle segment of the Henry Hudson Trail, and the western terminus of the eastern section. Matawan is governed under the Borough form of New Jersey municipal government. The governing body consists of a Mayor and a Borough Council comprising six council members, with all positions elected at-large on a partisan basis as part of the November general election. A Mayor is elected directly by the voters to a four-year term of office. The Borough Council consists of six members elected to serve three-year terms on a staggered basis, with two seats coming up for election each year in a three-year cycle. The Borough form of government used by Matawan, the most common system used in the state, is a "weak mayor / strong council" government in which council members act as the legislative body with the mayor presiding at meetings and voting only in the event of a tie. The mayor can veto ordinances subject to an override by a two-thirds majority vote of the council. The mayor makes committee and liaison assignments for council members, and most appointments are made by the mayor with the advice and consent of the council. As of 2016[update], the Mayor of Matawan is Democrat Joseph Altomonte whose term of office ends December 31, 2019. Members of the Matawan Borough Council are Council President Joseph Urbano (R, 2017), Michael Caldon (R, 2017), Linda Clifton (R, 2016), Donna Gould (R, 2016), Nicolas Reeve (D, 2018) and Michael Vergaretti (D, 2018). In May 2015, Councilmember Toni Marie Angelini announced that she would be resigning from office at the end of June as she was relocating to Wall Township. After the general election vote for mayor in November 2007 ended in a tie, a special runoff election was held in January 2008, in which Republican Paul Buccellato took 51% of the vote and defeated the incumbent, Democrat Mary Aufseeser, who had just short of 49%. Matawan is located in the 6th Congressional District and is part of New Jersey's 12th state legislative district. Prior to the 2011 reapportionment following the 2010 Census, Matawan had been in the 13th state legislative district. For the 116th United States Congress, New Jersey's Sixth Congressional District is represented by Frank Pallone (D, Long Branch). New Jersey is represented in the United States Senate by Democrats Cory Booker (Newark, term ends 2021) and Bob Menendez (Paramus, term ends 2025). For the 2018–2019 session (Senate, General Assembly), the 12th Legislative District of the New Jersey Legislature is represented in the State Senate by Samuel D. Thompson (R, Old Bridge Township) and in the General Assembly by Robert D. Clifton (R, Matawan) and Ronald S. Dancer (R, Plumsted Township). The Governor of New Jersey is Phil Murphy (D, Middletown Township). The Lieutenant Governor of New Jersey is Sheila Oliver (D, East Orange). Monmouth County is governed by a Board of Chosen Freeholders consisting of five members who are elected at-large to serve three year terms of office on a staggered basis, with either one or two seats up for election each year as part of the November general election. At an annual reorganization meeting held in the beginning of January, the board selects one of its members to serve as Director and another as Deputy Director. As of 2018[update], Monmouth County's Freeholders are Freeholder Director Thomas A. Arnone (R, Neptune City, term as freeholder ends December 31, 2019; term as freeholder director ends 2018), Freeholder Deputy Director Lillian G. Burry (R, Colts Neck Township, term as freeholder ends 2020; term as deputy director ends 2018), John P. Curley (R, Middletown Township, 2018), Patrick G. Impreveduto (R, Holmdel Township, 2020) and Dr. Gerry P. Scharfenberger (R, Middletown Township, 2019; appointed to serve an unexpired term). Constitutional officers elected on a countywide basis are County clerk Christine Giordano Hanlon (R, 2020; Ocean Township), Sheriff Shaun Golden (R, 2019; Howell Township) and Surrogate Rosemarie D. Peters (R, 2021; Middletown Township). As of March 23, 2011, there were a total of 5,315 registered voters in Matawan, of which 1,355 (25.5%) were registered as Democrats, 1,136 (21.4%) were registered as Republicans and 2,820 (53.1%) were registered as Unaffiliated. There were 4 voters registered to other parties. In the 2012 presidential election, Democrat Barack Obama received 52.1% of the vote (1,937 cast), ahead of Republican Mitt Romney with 46.6% (1,732 votes), and other candidates with 1.3% (50 votes), among the 3,753 ballots cast by the borough's 5,667 registered voters (34 ballots were spoiled), for a turnout of 66.2%. In the 2008 presidential election, Democrat Barack Obama received 49.9% of the vote (2,090 cast), ahead of Republican John McCain with 47.3% (1,983 votes) and other candidates with 1.4% (57 votes), among the 4,188 ballots cast by the borough's 5,604 registered voters, for a turnout of 74.7%. In the 2004 presidential election, Republican George W. Bush received 52.3% of the vote (2,081 ballots cast), outpolling Democrat John Kerry with 47.3% (1,880 votes) and other candidates with 0.5% (29 votes), among the 3,978 ballots cast by the borough's 5,440 registered voters, for a turnout percentage of 73.1. In the 2013 gubernatorial election, Republican Chris Christie received 68.2% of the vote (1,638 cast), ahead of Democrat Barbara Buono with 30.3% (727 votes), and other candidates with 1.5% (37 votes), among the 2,432 ballots cast by the borough's 5,678 registered voters (30 ballots were spoiled), for a turnout of 42.8%. In the 2009 gubernatorial election, Republican Chris Christie received 58.0% of the vote (1,639 ballots cast), ahead of Democrat Jon Corzine with 32.5% (920 votes), Independent Chris Daggett with 7.5% (213 votes) and other candidates with 1.2% (35 votes), among the 2,827 ballots cast by the borough's 5,377 registered voters, yielding a 52.6% turnout. Matawan is part of the Matawan-Aberdeen Regional School District (MARSD), which also serves students from the neighboring community of Aberdeen Township. The district is a comprehensive system comprising seven schools, which includes one preschool, three elementary schools grades K-3, one 4-5 school, one middle school grades 6-8, one high school grades 9-12. As of the 2015-16 school year, the district's seven schools had an enrollment of 3,861 students and 333.3 classroom teachers (on an FTE basis), for a student–teacher ratio of 11.6:1. Schools in the district (with 2015-16 enrollment data from the National Center for Education Statistics) are Cambridge Park Developmental Learning Center (Preschool; 96 students), Cliffwood Elementary School (K-3; 351), Ravine Drive Elementary School (K-3; 377), Strathmore Elementary School (K-3; 464), Lloyd Road Elementary School (4-5; 593), Matawan Aberdeen Middle School (6-8; 889) and Matawan Regional High School. (9-12; 1,057). As of May 2010[update], the borough had a total of 31.45 miles (50.61 km) of roadways, of which 24.37 miles (39.22 km) were maintained by the municipality, 4.50 miles (7.24 km) by Monmouth County and 2.50 miles (4.02 km) by the New Jersey Department of Transportation. Matawan is traversed by Route 34, Route 79 and County Route 516. The Garden State Parkway skirts the northern end of the borough (with the southbound lanes only passing through briefly); the nearest exits are exits 117A and 120. 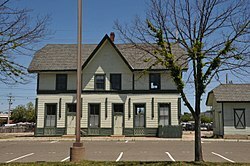 In the late 20th century, Matawan became known for its heavily used train station at Aberdeen-Matawan on NJ Transit's North Jersey Coast Line, which attracts riders from all over western Monmouth County and provides service to New York City's Penn Station, either directly or via Secaucus Junction. NJ Transit also provides bus service to the Port Authority Bus Terminal in Midtown Manhattan on the 133 and 135 bus lines. See also: Category:People from Matawan, New Jersey. Monica Aksamit (born 1990), saber fencer who won a bronze medal at the 2016 Summer Olympics in the Women's Saber Team event. Joseph D. Bedle (1821–1894), 23rd Governor of New Jersey, in office from 1875 to 1878. Gerard Canonico (born 1989), stage actor. Connor Clifton (born 1995), ice hockey defenseman for the Boston Bruins of the NHL. Robert D. Clifton (born 1968), member of the New Jersey General Assembly who was Mayor of Matawan from 1996 to 2005. Terry Deitz (born 1959), third-place finisher on Survivor: Panama. Edward P. Felt (1959–2001), passenger aboard United Airlines Flight 93 on his way who is believed to have made one of the last calls to 911 immediately prior to the fatal crash of the jetliner. Philip Freneau (1752–1832), poet during the American Revolutionary War. Elmer H. Geran (1875–1964), represented New Jersey's 3rd congressional district from 1925 to 1927. Delores Holmes (born 1946), soul singer. Erison Hurtault (born 1984), 400m Olympian track runner. Jim Jeffcoat (born 1961), professional football player for the Dallas Cowboys and the Buffalo Bills from 1983 to 1997. Howard Kremer (born 1971), comedian and comedic rapper. Richard Reines, recording industry executive who is co-owner of Drive-Thru Records, a record label specializing largely in pop punk music. William H. Sutphin (1887–1972) represented New Jersey's 3rd congressional district from 1931 to 1943, and was mayor of Matawan from 1915 to 1916 and 1921 to 1926. Tammy Lynn Sytch, professional wrestling manager best known for her time in the World Wrestling Federation as the character, Sunny. Thom Wasluck, musician and singer-songwriter who known for his music project Planning for Burial. Jacqueline Walker (born 1941), politician who served in the New Jersey General Assembly from 1984 to 1986. Greg Wyshynski (born 1977), sportswriter. Matawan was ranked by BusinessWeek magazine at #12 in the nation on their list of "The 50 Best Places to Raise Your Kids" in November 2007. ^ a b Mayor and Council, Borough of Matawan. Accessed July 18, 2016. ^ 2017 New Jersey Mayors Directory, New Jersey Department of Community Affairs. Accessed May 30, 2017. ^ Administration, Borough of Matawan. Accessed July 18, 2016. ^ Borough Directory, Borough of Matawan. Accessed July 18, 2016. ^ a b 2012 New Jersey Legislative District Data Book, Rutgers University Edward J. Bloustein School of Planning and Public Policy, March 2013, p. 67. ^ U.S. Geological Survey Geographic Names Information System: Borough of Matawan, Geographic Names Information System. Accessed March 7, 2013. ^ a b c d e f DP-1 - Profile of General Population and Housing Characteristics: 2010 for Matawan borough, Monmouth County, New Jersey, United States Census Bureau. Accessed July 30, 2012. ^ a b c d Municipalities Grouped by 2011–2020 Legislative Districts, New Jersey Department of State, p. 6. Accessed January 6, 2013. ^ a b c Profile of General Demographic Characteristics: 2010 for Matawan borough, New Jersey Department of Labor and Workforce Development. Accessed July 30, 2012. ^ a b GCT-PH1 Population, Housing Units, Area, and Density: 2010 - State -- County Subdivision from the 2010 Census Summary File 1 for New Jersey, United States Census Bureau. Accessed August 5, 2013. ^ Look Up a ZIP Code for Matawan, NJ, United States Postal Service. Accessed July 30, 2012. ^ Zip Codes, State of New Jersey. Accessed August 28, 2013. ^ Area Code Lookup - NPA NXX for Matawan, NJ, Area-Codes.com. Accessed July 17, 2015. ^ A Cure for the Common Codes: New Jersey, Missouri Census Data Center. Accessed July 30, 2012. ^ Table 7. Population for the Counties and Municipalities in New Jersey: 1990, 2000 and 2010, New Jersey Department of Labor and Workforce Development, February 2011. Accessed July 30, 2012. ^ Chang, Kathy; and Kesten, Karen L. "Birth of a town", The Hub, January 7, 2010. Accessed June 5, 2017. "Matawan means where 'two rivers come together' in Lenape. Its Native American name was 'Mechananienk.' The Dutch settlers and Indian tribe name on a 1656 map was 'Matovancons.'" ^ Hutchinson, Viola L. The Origin of New Jersey Place Names, New Jersey Public Library Commission, May 1945. Accessed July 20, 2015. "'Where two rivers come together' (Tr, Ru) or mechavwanienk, 'ancient path' (B)"
^ Grumet, Robert S. Manhattan to Minisink: American Indian Place Names in Greater New York and Vicinity, p. 84. University of Oklahoma Press, Norman, OK, 2013. ISBN 9780806189130. Accessed July 20, 2015. ^ Gannett, Henry. The Origin of Certain Place Names in the United States, p. 19. United States Government Printing Office, 1905. Accessed September 4, 2015. ^ Snyder, John P. The Story of New Jersey's Civil Boundaries: 1606–1968, Bureau of Geology and Topography; Trenton, New Jersey; 1969. p. 182. Accessed July 30, 2012. ^ "The Shark Attacks That Were the Inspiration for Jaws; One rogue shark. Five victims. A mysterious threat. And the era of the killer great white was born", Smithsonian (magazine), August 7, 2012. Accessed October 17, 2013. "The rogue great white traveled 30 miles north of Spring Lake and into Matawan Creek. On July 12, Lester Stillwell, 11, was playing in the creek 16 miles inland when the shark attacked. A young man named Watson Stanley Fisher attempted to save the boy, but was fatally injured in the process." ^ Nolan, M.S. (1999). Fundamentals of air traffic control. Pacific Grove, CA: Brooks Cole Publishing Company. ^ Areas touching Matawan, MapIt. Accessed July 16, 2015. ^ O'Dea, Colleen. "The List: Donuts, Holes, and Exclaves -- New Jersey's Weird Geography", NJ Spotlight, March 24, 2014. Accessed July 19, 2015. "The two sections of Aberdeen are separated by a piece of Matawan borough that is only about a third of a mile wide." ^ "United States Census 1890: Minor Civil Divisions Mississippi - Ohio, United States Census Bureau. Accessed July 8, 2016. ^ Compendium of censuses 1726–1905: together with the tabulated returns of 1905, New Jersey Department of State, 1906. Accessed August 5, 2013. ^ Thirteenth Census of the United States, 1910: Population by Counties and Minor Civil Divisions, 1910, 1900, 1890, United States Census Bureau, p. 338. Accessed July 30, 2012. ^ Fifteenth Census of the United States : 1930 - Population Volume I, United States Census Bureau, p. 717. Accessed July 30, 2012. ^ Table 6. New Jersey Resident Population by Municipality: 1930 - 1990, New Jersey Department of Labor and Workforce Development. Accessed June 28, 2015. ^ a b c d e Census 2000 Profiles of Demographic / Social / Economic / Housing Characteristics for Matawan borough, New Jersey, United States Census Bureau. Accessed July 30, 2012. ^ a b c d e DP-1: Profile of General Demographic Characteristics: 2000 - Census 2000 Summary File 1 (SF 1) 100-Percent Data for Matawan borough, Monmouth County, New Jersey, United States Census Bureau. Accessed July 30, 2012. ^ DP03: Selected Economic Characteristics from the 2006–2010 American Community Survey 5-Year Estimates for Matawan borough, Monmouth County, New Jersey, United States Census Bureau. Accessed June 21, 2012. ^ Henry Hudson Trail, Monmouth County Park System. Accessed November 19, 2011. ^ Cerra, Michael F. "Forms of Government: Everything You've Always Wanted to Know, But Were Afraid to Ask", New Jersey State League of Municipalities. Accessed November 30, 2014. ^ "Forms of Municipal Government in New Jersey", p. 6. Rutgers University Center for Government Studies. Accessed June 3, 2015. ^ Your Government, Borough of Matawan. Accessed July 18, 2016. ^ 2015 Municipal Data Sheet, Borough of Matawan. Accessed July 18, 2016. As of date accessed, no 2016 budget was available on the website. ^ Monmouth County Directory 2016, Monmouth County, New Jersey. Accessed July 14, 2016. ^ November 3, 2015 General Election Official Results, Monmouth County, New Jersey, updated January 27, 2016. Accessed July 14, 2016. ^ November 4, 2014 General Election Official Results, Monmouth County, New Jersey, updated November 24, 2014. Accessed July 14, 2016. ^ Official Election Results - General Election November 5, 2013, Monmouth County, New Jersey Accessed July 14, 2016. ^ Staff. "Toni Marie Angelini Resigns From Matawan Council Effective June 30", More Monmouth Musings, May 14, 2015. Accessed October 30, 2015. "Matawan Councilwoman Toni Marie Angelini has resigned from the borough's governing body effective June 30. Angelini, who declined to seek reelection this year, is moving to Wall Township." ^ Pizarro, Max. "Buccellato defeats Aufseeser in Matawan mayor's race", Politicker NJ, January 15, 2008. Accessed October 17, 2013. "Republican Councilman Paul Buccellato defeated Democratic Mayor Mary Aufseeser in a special election in Matawan on Tuesday. Running again after their initial showdown last November resulted in a tie, Buccellato won with 51.15% of the vote to Aufseeser's 48.70%, according to unofficial results filed with the Monmouth County Clerk's Office Tuesday night." ^ 2017 New Jersey Citizen's Guide to Government, p. 60, New Jersey League of Women Voters. Accessed May 30, 2017. ^ 2011 New Jersey Citizen's Guide to Government, p. 60, New Jersey League of Women Voters. Accessed May 22, 2015. ^ Biography, Congressman Frank Pallone Jr. Accessed January 3, 2019. "Frank Pallone, Jr., was born in Long Branch, New Jersey, where he grew up and still resides." ^ District 12 Legislators, New Jersey Legislature. Accessed January 22, 2018. ^ Monmouth County Government, Monmouth County, New Jersey. Accessed February 18, 2018. ^ Freeholder Thomas A. Arnone, Monmouth County, New Jersey. Accessed February 18, 2018. ^ Freeholder Lillian G. Burry, Monmouth County, New Jersey. Accessed February 18, 2018. ^ Freeholder John P. Curley, Monmouth County, New Jersey. Accessed February 18, 2018. ^ Freeholder Patrick Impreveduto, Monmouth County, New Jersey. Accessed February 18, 2018. ^ Freeholder Gerry P. Scharfenberger, Ph.D., Monmouth County, New Jersey. Accessed February 18, 2018. ^ Freeholder Gary J. Rich Sr., Monmouth County, New Jersey. Accessed February 4, 2014. ^ The Monmouth County Clerk, Monmouth County, New Jersey. Accessed February 18, 2018. ^ Members List: Clerks, Constitutional Officers Association of New Jersey. Accessed February 18, 2018. ^ About Sheriff Shaun Golden, Monmouth County Sheriff's Office. Accessed February 18, 2018. ^ Members List: Sheriffs, Constitutional Officers Association of New Jersey. Accessed February 18, 2018. ^ Monmouth County Surrogate, Monmouth County, New Jersey. Accessed February 18, 2018. ^ Voter Registration Summary - Monmouth, New Jersey Department of State Division of Elections, March 23, 2011. Accessed December 5, 2012. ^ "Presidential General Election Results - November 6, 2012 - Monmouth County" (PDF). New Jersey Department of Elections. March 15, 2013. Retrieved December 24, 2014. ^ "Number of Registered Voters and Ballots Cast - November 6, 2012 - General Election Results - Monmouth County" (PDF). New Jersey Department of Elections. March 15, 2013. Retrieved December 24, 2014. ^ 2008 Presidential General Election Results: Monmouth County, New Jersey Department of State Division of Elections, December 23, 2008. Accessed December 5, 2012. ^ 2004 Presidential Election: Monmouth County, New Jersey Department of State Division of Elections, December 13, 2004. Accessed December 5, 2012. ^ "Governor - Monmouth County" (PDF). New Jersey Department of Elections. January 29, 2014. Retrieved December 24, 2014. ^ "Number of Registered Voters and Ballots Cast - November 5, 2013 - General Election Results - Monmouth County" (PDF). New Jersey Department of Elections. January 29, 2014. Retrieved December 24, 2014. ^ 2009 Governor: Monmouth County, New Jersey Department of State Division of Elections, December 31, 2009. Accessed December 5, 2012. ^ District information for Matawan-Aberdeen Regional School District, National Center for Education Statistics. Accessed September 22, 2018. ^ School Data for the Matawan-Aberdeen Regional School District, National Center for Education Statistics. Accessed September 22, 2016. ^ Cambridge Park Developmental Learning Center, Matawan-Aberdeen Regional School District. Accessed January 22, 2015. ^ Cliffwood Elementary School, Matawan-Aberdeen Regional School District. Accessed January 22, 2015. ^ Ravine Drive Elementary School, Matawan-Aberdeen Regional School District. Accessed January 22, 2015. ^ Strathmore Elementary School, Matawan-Aberdeen Regional School District. Accessed January 22, 2015. ^ Lloyd Road Elementary School, Matawan-Aberdeen Regional School District. Accessed January 22, 2015. ^ Matawan Aberdeen Middle School, Matawan-Aberdeen Regional School District. Accessed January 22, 2015. ^ Matawan Regional High School, Matawan-Aberdeen Regional School District. Accessed January 22, 2015. ^ New Jersey School Directory for the Matawan-Aberdeen Regional School District, New Jersey Department of Education. Accessed December 29, 2016. ^ Monmouth County Mileage by Municipality and Jurisdiction, New Jersey Department of Transportation, May 2010. Accessed July 14, 2014. ^ Aberdeen Matawan station, NJ Transit. Accessed October 17, 2013. ^ North Jersey Coast Line, NJ Transit. Accessed October 17, 2013. ^ Routes by County: Monmouth County, NJ Transit, backed up by the Internet Archive as of May 22, 2009. Accessed November 19, 2011. ^ Monica Aksamit, Penn State Nittany Lions. Accessed August 16, 2016. "Hometown: Matawan, N.J.; High School: Matawan Regional"
^ New Jersey Governor Joseph Dorsett Bedle, National Governors Association. Accessed June 5, 2017. "Joseph D. Bedle, the twenty-ninth governor of New Jersey, was born in Matawan, New Jersey on January 5, 1831." ^ Hemhauser, Danielle. "Setting the stage", Asbury Park Press, March 28, 2006. Accessed August 10, 2012. "Mater Dei High School is connected to Broadway through Gerard Canonico, 16, a junior from Matawan." ^ Caldwell, Dave. "At Quinnipiac, Brothers May Add an N.C.A.A. Title to Their Bond", The New York Times, March 28, 2016. Accessed November 19, 2018. "When Tim and Connor Clifton, brothers from Matawan, N.J., decided to attend Quinnipiac University to major in mechanical engineering and play hockey together, they took one more bold step.... Tim and Connor Clifton were teammates at the perennially powerful Christian Brothers Academy in Lincroft, N.J., before Tim graduated and joined the Hitmen." ^ Assemblyman Robert D. Clifton, New Jersey Legislature. Accessed August 9, 2012. ^ Terry Deitz actor profile, The South African TV Authority. Accessed July 30, 2012. "Deitz was born and raised in Matawan, New Jersey, by his mother, Peggy and father, George." ^ Longman, Jere. "A Nation Challenged: The Pennsylvania Crash; Cockpit Tape Offers Few Answers but Points to Heroic Efforts", The New York Times, March 27, 2002. Accessed December 5, 2012. "Earlier reports have said that a previously unidentified passenger, Edward Felt of Matawan, N.J., said in a 911 call from a restroom that he saw a puff of smoke and heard an explosion, leading some to cite this as evidence that the plane was shot down by the military to prevent it from crashing into sensitive targets." ^ Capuzzo, Jill P. "2 Lakes, the Shore and a Train to the City", The New York Times, February 19, 2010. Accessed July 30, 2012. "The expanded Cape that Ms. Bragg and Mr. Colón bought last October for $370,000 is in the Freneau section — a hilly, wooded area named after the Revolutionary War poet Philip Freneau, who lived here and is buried in the neighborhood." ^ Elmer Hendrickson Geran, Biographical Directory of the United States Congress. Accessed July 11, 2007. ^ Biography - Delores Holmes, West End Arts. Accessed July 28, 2007. "From Matawan, NJ, Delores Holmes (Contralto) was raised in a gospel family." ^ Denman, Elliott. "Matawan graduate Hurtault running toward a dream", Asbury Park Press, August 18, 2009. Accessed November 19, 2011. ^ Jim Jeffcoat Archived 2006-08-31 at the Wayback Machine, database Football. Accessed November 27, 2007. ^ Gosselin, Rick. "New-found rivals", The Dallas Morning News, August 8, 1993. Accessed August 14, 2012. "But Jeffcoat, who grew up in Matawan, NJ, never bought into the America's Team mystique." ^ Meyers, James. "Howard Kremer Interview: SXSW 2010", Spinner, March 15, 2010. Accessed October 20, 2012. "I'm originally from Matawan, New Jersey. I was in a bunch of bands while I was in college." ^ Genzlinger, Neil. "Jersey; Finding the Line in a Line Drive", The New York Times, March 20, 2005. Accessed September 22, 2018. "Certainly Bob McKenty of Matawan does, and he has a new book to prove it: Fair Game: Open Season on Baseball, which consists entirely of his frivolous verses about the sport." ^ La Gorce, Tammy. "Finding Emo", The New York Times, August 14, 2005. Accessed October 22, 2007. "'We came back, because as label owners we couldn't be away from it,' said Mr. Reines, who is from Fort Lee. He recently bought a house in Matawan and, for business reasons, now splits his time between the two states." ^ William Halstead Sutphin, Biographical Directory of the United States Congress. Accessed August 30, 2007. ^ Tammy Lynn Sytch, Online World of Wrestling. Accessed July 30, 2012. ^ O'Connor, Andy (May 14, 2014). "Planning For Burial - Desideratum". Pitchfork. Retrieved October 11, 2014. ^ Fitzgerald's Legislative Manual, 1984, p. 251. Accessed November 18, 2017. "Jacqueline Walker, Dem., Matawan Assemblywoman Walker was born in Jersey City Nov. 7, l941. She attended elementary school and Memorial High School in West New York." ^ Greg Wyshynski Bio, Blogs With Balls. Accessed December 27, 2015. "A graduate of the University of Maryland's College of Journalism and a native of Matawan, NJ, Mr. Wyshynski currently resides in Ashburn, Va., a suburb of Washington, DC." ^ No. 12: Matawan, N.J., BusinessWeek, November 2007. Accessed November 27, 2007. Wikimedia Commons has media related to Matawan, New Jersey. This page was last edited on 26 February 2019, at 23:35 (UTC).